Waka, waka... in case you didn;t notice it was Halloween this week! Seriously, maybe president Trump should make it a law that Halloween is the last saturday of October all around the world. Does he have that kind of power? haha! This post is part of a blog circle- where talented family photographers from Montreal and other areas of Quebec, will be sharing their fall inspired photos. Please scroll to the bottom of the post and click on Caroline Desroches' name to see what they have been up to and then keep going through the circle until you end back here. I usually sew up some costumes for the kids, you can check my previous Halloween posts HERE. I had great plans to do it again this year, I actually really enjoy making the costumes and we usually try and get a matching theme for both kids. This year my daughter changed her mind, and decided to wear a vintage Lion leotard I bought at a garage sale when she was only 1 year old. Well, for one it is handmade, just not by me and secondly it finally fits perfectly! We added some lion years and mane we've had since her Leo themed birthday which was for her third birthday! And a little makeup to complete the look. 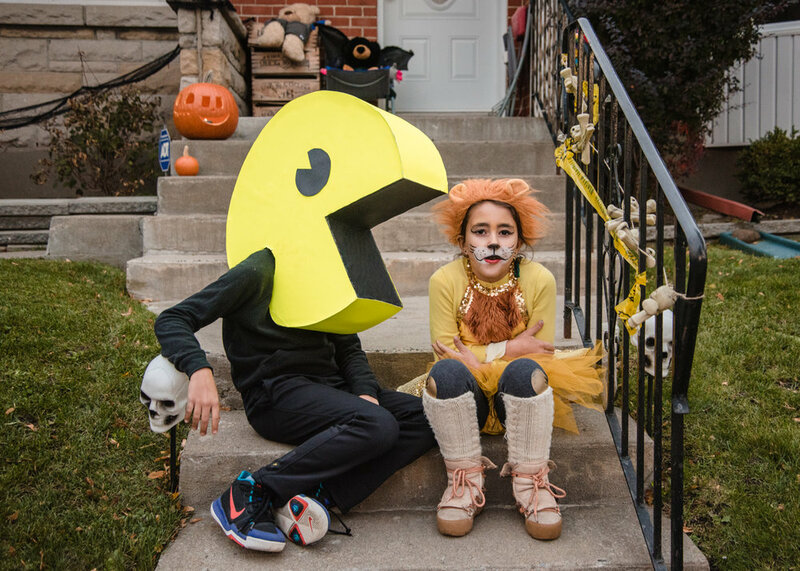 My son decided to be Pacman... the original version. If you follow my Instagram stories, you might have seen the process. I made the head from cardboard and had great plans to spray paint it. Well it rained like crazy last weekend and in the end the paint didn;t even work out. So on tuesday at 3pm I was buying some neon yellow cardboard to finish up the head. A little glue and some meash for him to see through and I was done... just on time. Some black clothes and his funky running shoes was that was needed to complete his look. We waited somewhat patiently for the sun to come down and daddy cool to get home. The kids were too excited to eat dinner and might have squealed when the first kids showed up at our door to trick or treat. The kids had lot's of fun designing and carving their pumpkins. Can you guess who did which? Of we went... in the cold and a little rain! MissE's bucket broke and those small pumpkin containers weren't big enough to carry all the candy they got. 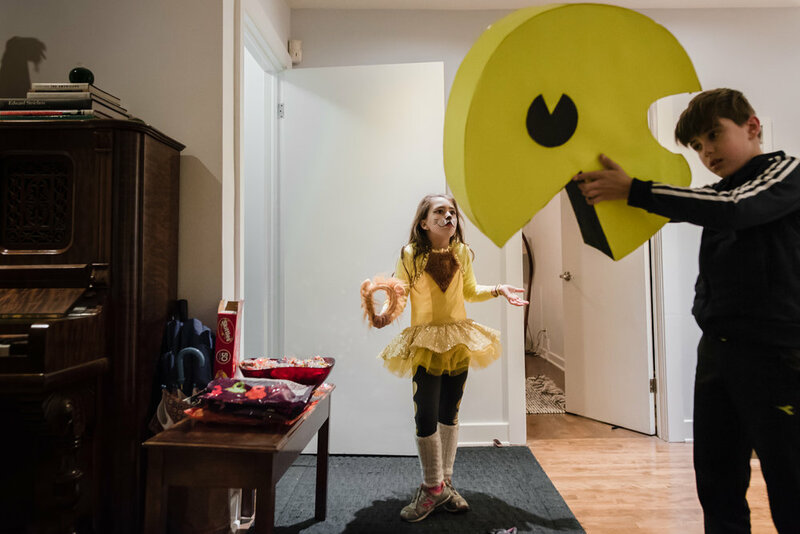 Pacman was a big success. Some people I think forgot there was a kid in there and felt compelled to knock on his head! I am not sure what they were trying to figure out, but yeah I didn't go pulling on little kids wigs all night to make sure it wasn't real hair. Sigh. I didn't get as many photos as I hoped for. My kids were not stopping or slowing down for my creative needs. Good thing I shoot with a documentary approach! Every year I have high hopes and then fail miserably. This year I cranked my ISO way to high and my photos came out so grainy. At least we still have some memories and candy for the entire year. I say mission accomplished. 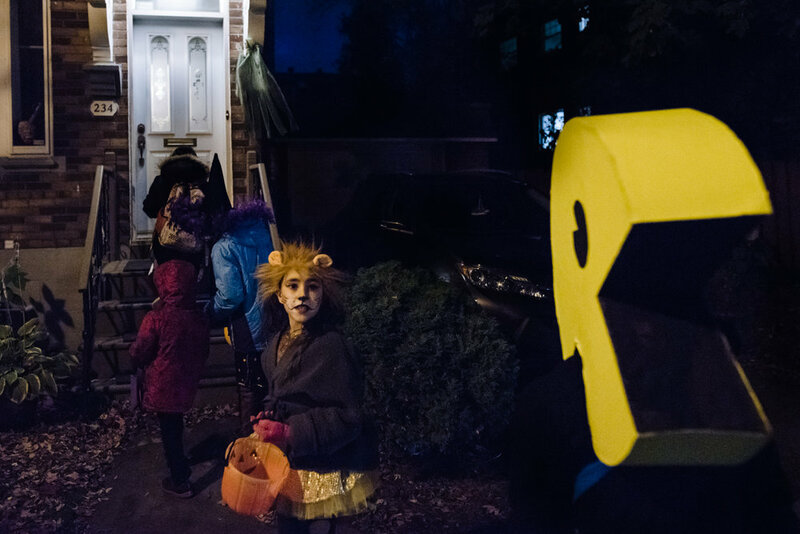 Now go have look at how Caroline Desroches spent her Halloween!